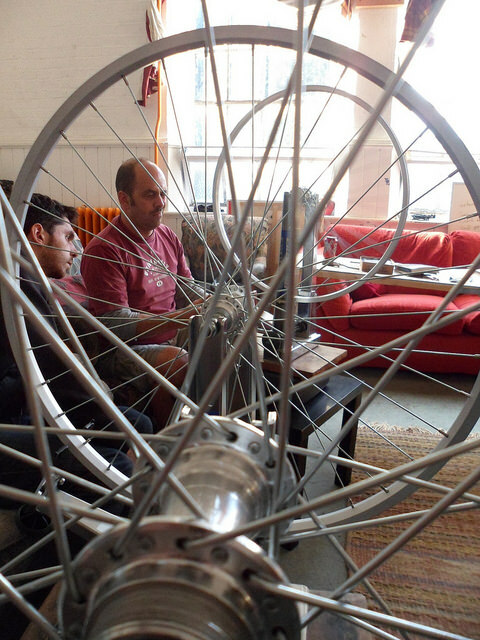 Every month or so, we are introducing some of the great people involved with Broken Spoke, finding out what gets their wheels turning and keeps their freewheels ticking. Up this month – Tim! Mainly mechanic – because that’s where my skills lie. I’ve tried a lot of other things, so administration… But I prefer to stick to the mechanicking, since I know that’s what I’m okay at. I’ve got two sons and I wanted them to fix their own bikes for a change, so we came up and did the basic bike Oxford Cycle Workshop. 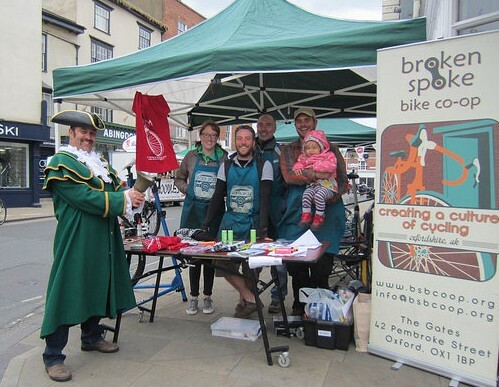 I really liked the idea of it being a co-op, and the open workshop part of Oxford Cycle Workshop, but it wasn’t that big a part of what they did. So when Oxford Cycle Workshop folded, and Broken Spoke was founded, I volunteered straight away. And then a couple of years ago, I put myself through a mechanics qualification, and Broken Spoke were looking for someone, and thought, he doesn’t look too unfriendly, and he looks like he knows what he’s talking about, and they asked if I could run some workshops. And I’ve really enjoyed them, they’re a fantastic learning environment – don’t let the mechanics ever tell you that they don’t learn anything! It was a Raleigh Rebel, which I think was bought second hand from my cousin. I got it for Christmas, and by Easter, I’d taken it apart and painted it bright orange with Humbrol Enamel. The gears never worked properly after that..
Lots! My dream would be a garage full of dream bikes. I like to do everything. Last year I went to Dave Yates, and built my own frame. And I’m blissfully happy with it. It does everything I want to pretty well, and I think that’s as much as you can ask of one bike. If you want a bike that goes fast, then it has to be set up a certain way, and if you want a bike that goes everywhere it has to be set up a certain way. You can’t have both.. I got my wife’s frame sprayed at the same time, with the same paintjob, and they both have the same style – green, silver mudguards, brown bar tape, brown saddles, but hers is a 1970s Resto’ and mine is a 2015 Retro. They each look good, but together, they look blinding! There is a playlist on the workshop computer, called Tim’s appalling taste in music. So best start there… I do like lots of stuff. I don’t think it’s particularly eccentric, or eclectic, but I just like lots of good music. I like to mix it up a bit – so people don’t get too comfortable! I like Desert Island Discs – where it can go anywhere – Shostakovich then The Saturdays! Winning a battle with a bottom bracket..! I like it when someone comes in with a problem and when, a fresh pair of eyes, and you can say. Ah, the problem is.. That! And then they go away and fix it themselves. That’s what I like at Broken Spoke – the best fixes are the ones people do themselves. Cleaning dirty stuff. But that’s the nice thing about Broken Spoke – you can say “before we start, this bike needs a jolly good clean – here’s a rag, come back in ten minutes!”. What’s your favourite bike ride (or what is the best ride you’ve been on)? I did a Friday night ride to the coast, from London, there’s a group called ‘the Fridays’ who do a ride that leaves Admiralty Arch at midnight on the Friday nearest to the full moon. I did one of their rides to Whitstable, and it was just beautiful. The distance was nice, the stopovers were nice, the company was brilliant. There are some flat marshes, just out the back of Whitstable, and just as we came across them, there were sheep in the mist, and it was blissful, just blissful. I like riding at night. Your perspective is different, because you don’t get the views, it’s much more personal, you are more enveloped, it’s much more just you, and the verge, and nothing beyond, but then you concentrate more on sights and smells and stuff, because it’s quieter. So you get a perspective you miss out on the day rides. Find what you enjoy. People tend to buy bicycles for a particular reason, be it commuting, fitness, a friend… But there is always more to cycling than what you bought the bike for, so, once you’ve done the commute, got fit, go and do something just for the fun of it, or something to challenge yourself, or a bit different. Buy a cargo bike, get a tricycle! Try and broaden your cycling horizons a little bit! A lot of people think cycling is Chris Froome, and what he does, but there is so much more to discover. Cycling, as an activity has got a lot more popular in the last five to ten years, but that has tended to be around a road-racing, quite athletic, style of riding. The challenge for people who love cycling is to get that interest to mature into something a bit more everyday – something people do as part of their life rather than something they do as a leisure activity lifestyle thing. Once you discover how to fit a bicycle to your life, it becomes a much more natural thing to do.